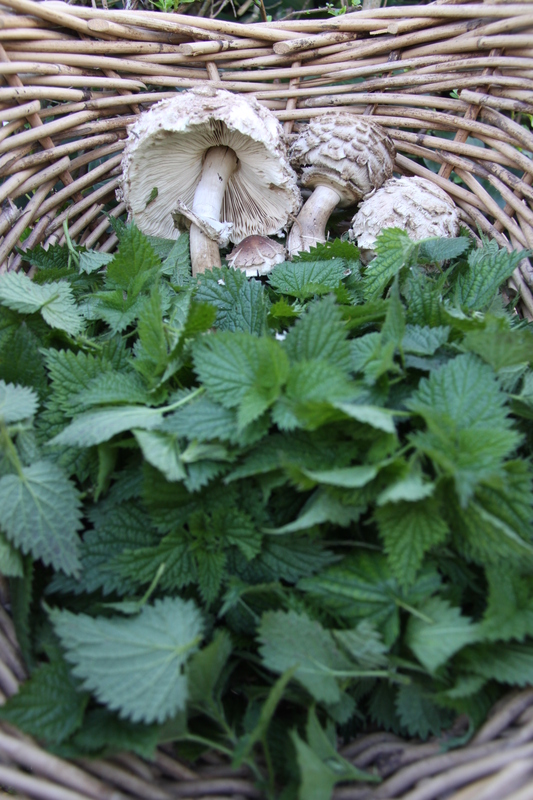 What a fantastic, unexpected find these were when out collecting nettles for my Stinging Nettle Soup. Whilst my lovely wife and excellent photographer Gemma Waldron was taking some close-ups of the nettles, I allowed myself a little wander around the delightful little open copse of Chestnuts and Pines that were loitering in the field just behind us. I had been to this spot many times – it is autumn abundance at its most prolific: Hips, Haws, Blackberries, Nettles, Sweet Chestnuts, and all manner of mushrooms. Indeed, it was mushrooms that I was hoping for: on previous visits I have found Wood Blewits, Fairy Ring Champignon, and, my absolute favourite, The Prince – but never before the Shaggy Parasol. I almost jumped for joy! 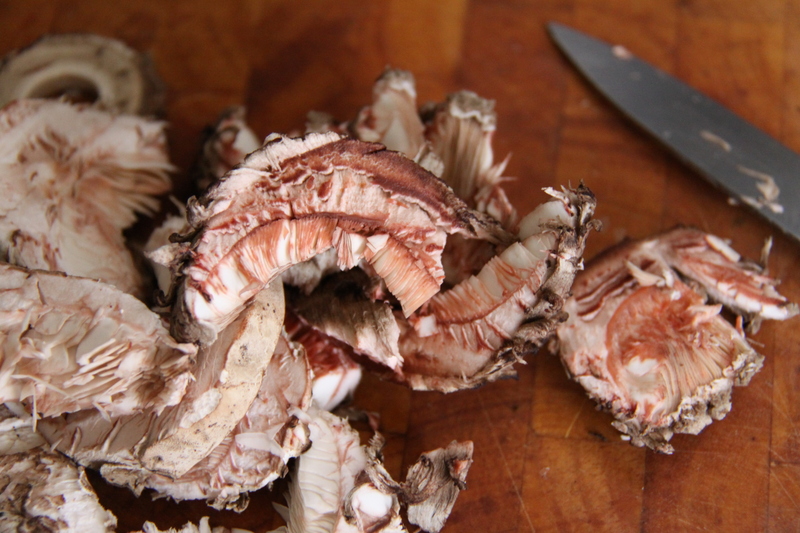 See my Forager’s Toolkit page for what you’ll need to gather wild mushrooms. Please read my Staying Alive post before heading out in search of mushrooms. The Shaggy Parasol. Open (left) it does indeed have the appearance of a parasol. When young and closed (right) it bears resemblance to a maraca or drumstick. Notice the bulbous base of the stems, and the ring around the stem on the open specimen. Click the photo to enlarge. The Shaggy Parasol is a great mushroom for beginners. Standing reasonably tall when fully grown at anything up to about 20cm, its ruffled cap, splitting and crumbling like a rain-cloud, quickly becomes familiar and once you’ve found a few you’ll be spotting them wherever you go in autumn. The closed caps of young specimens give the mushroom a shape somewhat akin to a maraca or child’s rattle. John Wright, the River Cottage mushroom guru, likens the shape at this stage to a ‘drumstick’, and I’d certainly agree (turkey drummers, anyone?). This mushroom has gills under the cap (some have tubes or spines) like those you find on the cultivated mushrooms that you buy at the supermarket. These, along with all of the mushroom’s flesh, turn a muddy red when bruised. This is an excellent feature to help determine identification: if the Shaggy Parasol you have picked does not bruise red then it is definitely something else and you must discard it. 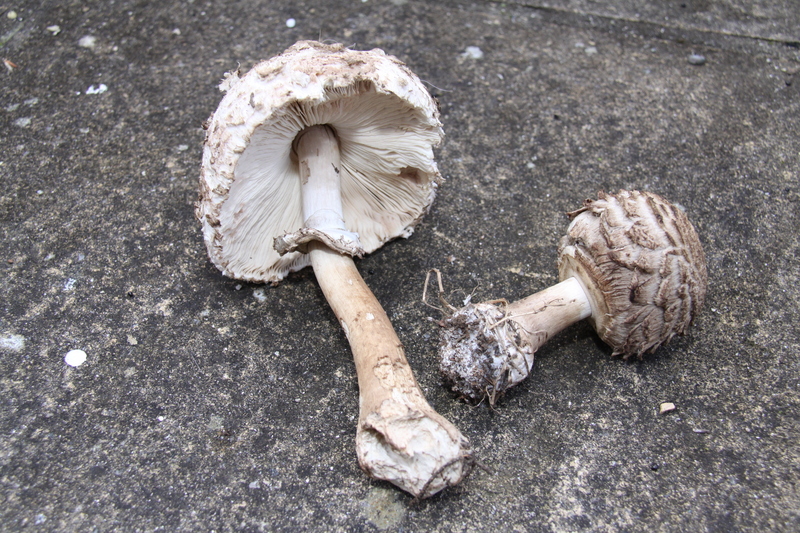 The stem is smooth, cream-coloured and also bruising red, and becoming very bulbous at the base. Shaggy Parasols with open caps leave a ring around the stem. This is double layered and can be moved, though may be a bit sticky, up and down the stem. For further pictures and description please see my Edible Mushrooms A-Z page. Warning: Shaggy Parasols must be cooked before consuming. The sliced segments of the Shaggy Parasol turning a deep muddy-red where cut. They look like cooked crayfish or even lobster tails, and to me no less exquisite. First you will need to remove the stem. This, unfortunately, is far too fibrous to eat. It is a shame to waste it, and can be added to stocks, such as a Veg Stock if you have one on the go or are planning one. You may also get away with adding them to soups if you have a decent blender. Otherwise I’m afraid its final destination will be the compost heap. With the stems removed, the closed young caps especially make ideal vessels for the stuffing and grilling/baking treatment. Or, you could tear the caps up into finger-food sized nuggets, coat in breadcrumbs or batter and deep fry (crunchy on the outside, juicy and tender on the inside. Fabulous.) I sliced and fried mine in a little garlic and thyme and sat them on top of my Stinging Nettle Soup. This is a great thing to do with a soup: the added texture really transforms the dish – give it a try, even if you only have cultivated mushrooms at hand. Read my Frying Wild Mushrooms page for tips on frying wild mushrooms. This entry was posted in Kitchen Tips, Mushrooms, Uncategorized and tagged cooking, family activities, foraging, John Wright, Macrolepiota rhacodes, parasol mushroom, River Cottage, shaggy parasol, wild food, wild mushrooms. Bookmark the permalink. How wonderful and how very lucky! Have never seen these where we live. Thank you very much. You’ll probably have to wait until next season now, though. But keep your eyes peeled – you’ll find them! I lived in Spain for some years and was a keen mushroom hunter then too, and I don’t think I ever found parasols there, except in the Pyrenees. I found one of these today! I was very surprised (though our weather has been very weird so not completely surprised). It’s going in a cream of mushroom soup with home cultivated shiitake, oyster, porcine and baby bellas. Just cooked up some that I found in my yard! My first. But wait, why must they be cooked first? Simply because – much like kidney beans or potatoes – they are poisonous raw. Hope you enjoyed your meal!! Thanks! I did have a couple of small bites raw. Then sautéed the rest in butter. No problems. Calke abbey in Ticknall Derbyshire Oak woodland and parasol mushrooms are everywhere. I started “hunting” mushrooms this year. This past weekend I had my first experience of being confident enough in my ID of the mushrooms to try eating them. They were delicious and now I’m even more excited about mushroom hunting.